By: Ava W., Ashari L.,Yazmine F., Haley T., Isabelle W., Miranda R., Aniyah H., Maddie V., Laila H., Alissa B., Declan J., Gavin T., Ryan C., Kyle S., David T., Carter C., Maggie S., Chase G., Isabella S., Eli R., Carlo G., Isabella S. and Joseph K.
When a group of 4th and 5th graders were asked to do an experiment for real scientists, we were excited. As kids, we’ve always wondered about those pesky ants, always trying to steal our cheetos and cookies. And, c’mon, everyone has always at one time or another, wanted to be the scientists in the plastic gloves and white lab coat, making cool discoveries. We set out to do our best. 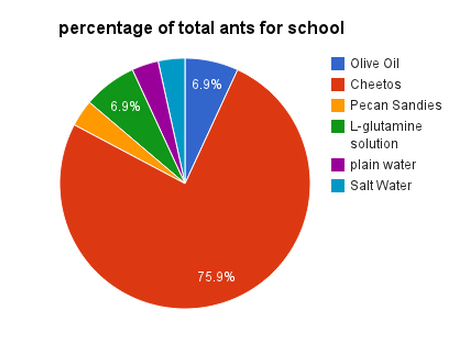 Our intentions were to find out what foods ants preferred. Cheetos? Sugar water? We didn’t know what would attract the ants and/or what they would choose. Would the environment around them affect the ants? A couple of the traps set by us students, didn’t even get any data! 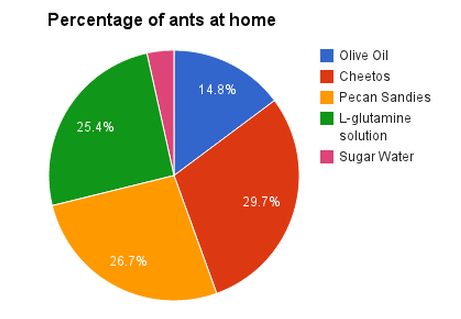 We thought the ants would eat the junk food more than health food. This is because the kids around and outside our school eat a large amount of junk food. Maybe the ants had adapted their diet to eat those cheeto crumbs left behind on the playground. As previous studies found, the ants are attracted to sugar, so they might eat the junk food more than they would healthy food. 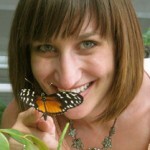 However, there is always a possibility for the ants to eat the healthier food, though less probable. Before we tested our baits, we wrote down our hypothesis. 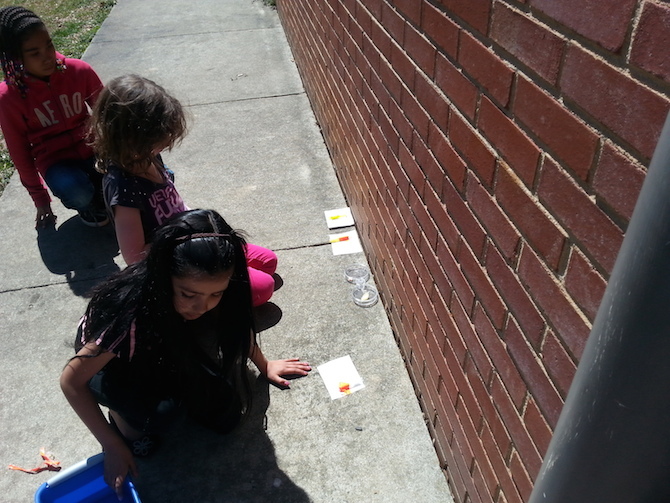 We followed the Ant Picnic protocol from School of Ants and the Your Wild Life lab at NCSU. Then, we set up our traps. 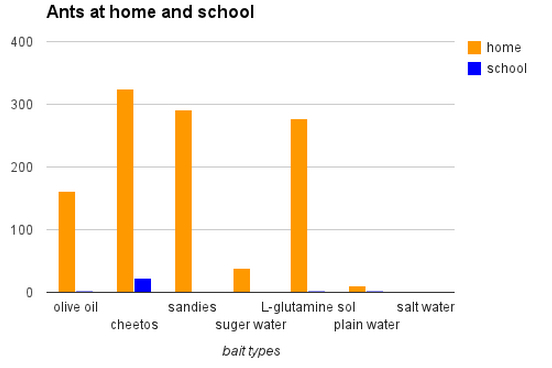 Us, the students, set out olive oil, Pecan Sandies, Cheetos, plain water, salt water, sugar water, protein powder water on index cards with the bait type, location, and group names. Then we decided to be creative. Laila H. came up with her own traps to do at her house. Skittles, Nutella, Jelly Biscuits, and Hershey bars were the baits she used. We decided to choose spots where there were a bunch of ants, and we attempted to camouflage the traps, by covering it with grass, and other natural materials. This was so the ants would be more at ease with the traps. After the traps were set, we waited for one hour before we went back and picked up the traps to count the number of ants there were, if any. Afterwards, we made a chart to see how many ants were collected in each bait. As some traps at school got destroyed by crows, 2nd graders, janitors, or other animals, we put “no data” in lots of forms. Next, we got into groups and each member in the group counted how many ants they saw. The interesting part was that each member in the group counted a different numbers of ants. To address the situation, so we could get the most accurate number of ants possible, we averaged the number based on every group member’s count. Finally, we discussed what happened at each one of our stations, where we went wrong, what we could have done better, and questions for future study. The results were quite interesting, because quite a few of the traps were destroyed and the ones that weren’t, were crawling with ants! A key observation was that we noticed ants do NOT go for the healthier baits, like protein powder. The ants didn’t go for the different types of water, (salt, sugar, etc.) or the Pecan Sandie cookies! Although, the Cheetos were a favorite among all the traps. Would that be because they like junk food, or they want to store it for later in the fall or winter? We didn’t get all the answers to our questions due to deadlines and EOG (End of Grade) testing, but this experiment was really interesting and exciting to participate in. When we set out the traps, some of a group’s traps got destroyed the first time they were put out, by janitors, crows, 2nd graders, or other animals. As a result, that group of students had to set up their traps again. We also found that ants are not all the same. At one tester’s house, the ants chewed through the plastic bags that the traps were contained in! We found that there were insects like ladybugs, spiders, one group even had a roly poly in their trap, and only one ant in it! We found that with some of the ants, if we left them in the bags for one or two days, then the ants curled up and died. What would happen if we changed the bait? How can the time of day affect how many ants will come to the traps? If we went out on a day with dark clouds, will that change how many ants come to the traps? Would the ants in our traps fight for the food? If they did, what would that affect? Is the reason there were so many ants in the traps because they were fighting for food, because they were from different colonies, or that they just wanted to rest there? What do you think what would happen if we put the same bait out and ran the tests again? Would we would have different data than we do now? Thank you to the scientists, formerly referred to as the “students,” who conducted these original research experiments and collaborated to write this paper. This preliminary research lays the groundwork for future studies that our lab will do related to ant diet preferences along with the help of our merry band of citizen scientists all around the world. Nice work! Way to go! This is excellent! So proud of these kids…and teachers.